Kashmir Moon Shawl | Auction Record | Fine Textiles | Skinner Inc.
Next time you sort through boxes in your basement, setting aside items for a yard sale, think twice about what these items may be worth. You could be the unknowing owner of a buried treasure. 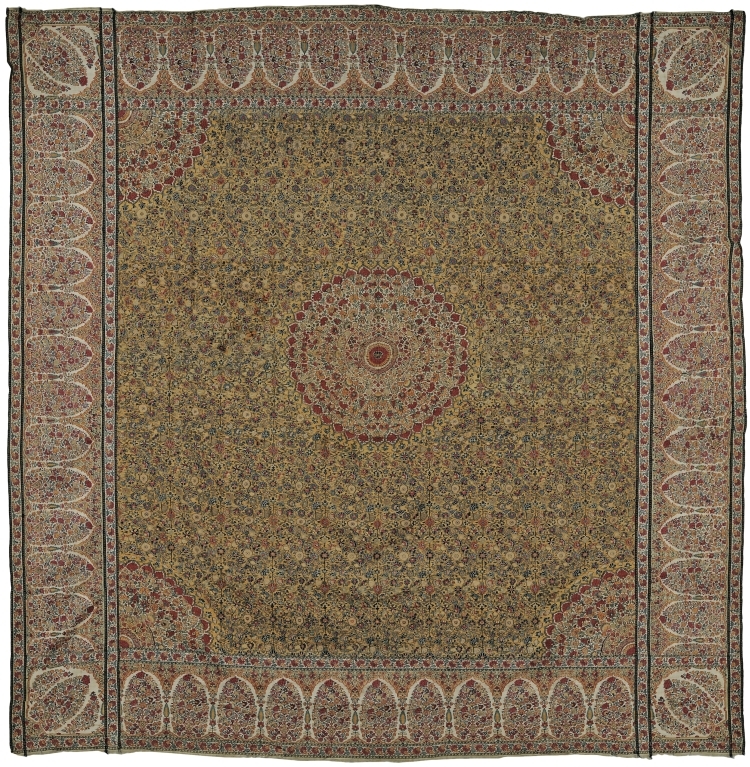 In the Skinner Oriental Rugs & Carpets auction on Saturday, February 11, 2012, An important Kashmir Moon Shawl hammered at $50,000 after intense, competitive bidding. The phone lines were all busy with bidders calling in from around the world. The shawl was made in North India in the early 19th century. The condition of the textile along with its rare beauty, great color, and delicate embroidery attracted serious attention in the market. Just a few months before the auction, the shawl was hiding away in the consignor’s basement, a forgotten yard sale purchase from 30 years ago. The consignor had bought the shawl because she was attracted to the lovely fabric pattern, and thought it might be a nice craft project to make a pillow from it someday. Thankfully, the pillow never got made, and when she came across the fabric many years later, she realized that it was all hand-stitched. The quality of the craftsmanship gave her pause, and she decided not to simply put it into another yard sale. Instead, she called Skinner auction house for a professional appraiser’s opinion. Gary Richards, director of the Oriental Rugs & Carpets department and an experienced appraiser of rugs and textiles, took a look at the piece, and instantly knew it was something special. Further research confirmed that the piece was an authentic Kashmir shawl and could be worth thousands of dollars. 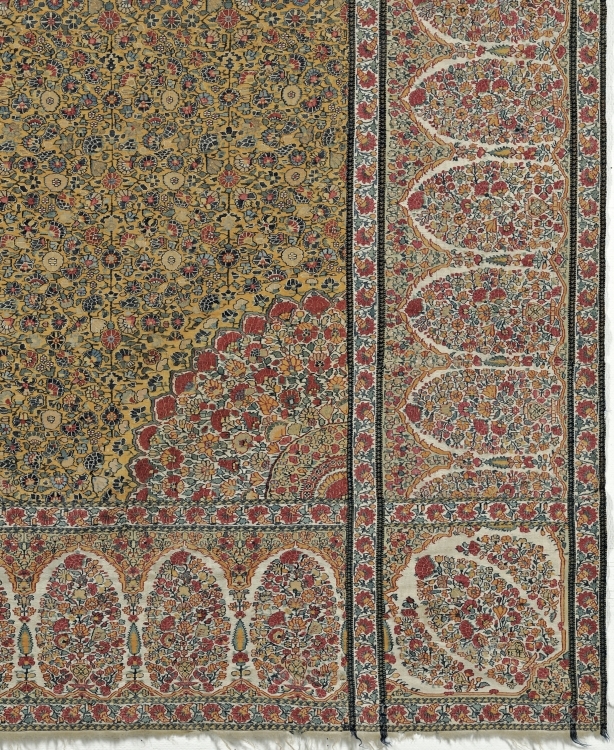 Much to the delight of both the consignor and Skinner, the shawl brought $59,250 with buyer’s premium, a world record for the sale of a Kashmir Moon Shawl at auction. Skinner expert appraisers are always available to give free verbal estimates of the value of art and antiques. Call 508-970-3299 to set up an appointment. It never hurts to ask; who knows where the next buried treasure will come from? This entry was posted in Blog and tagged Auction Highlights, auction record, buried treasure, experienced appraiser, fine textiles, Gary Richards, Get Inspired, historic textile, kashmir moon shawl, kashmir shawl, oriental rugs, Oriental Rugs & Carpets, rugs and textiles by Skinner. Bookmark the permalink. Over 20 yrs ago I had the opportunity of working at an Antique Oriental Rugs shop on Atlantic Ave in Brooklyn. Was a great experience. Always regretted the way it ended. It has always been on my mind and always hoped for the chance to tell my boss how much his help meant to me and that oddly enough I am the person I am today in part because of him. Don’t know if I’ll ever have that chance. Thanks Mr. Claudio Titone. Zach….. I would like to speak with you if possible. could you give me your phone number? Or I can give you mine. Thanks for the comment. To find out what your antiques may be worth at auction, please submit photos and an auction evaluation form on our website: secure.skinnerinc.com/appraisals/form.asp.